We had so many wonderful entries this week for Table Top Tuesday, I thought I would share a few with you that really caught my eye. If you need any inspiration for your Holiday Table, then hopefully you will find something here. JBigg's Little Pieces created this wonderful tablescape. I love the rusty oranges and browns and the beautiful amber glass. Gorgeous Pheasants too. Town and Country Living shared this as one possibility for her Thanksgiving Table. Love the elegant and the rustic mixed together. The Dragonfly On Iron Gate has the most fabulous setting complete with a fire in the fireplace for her gorgeous tablescape using some lovely Majolica. Beautiful. Corner of Plaid and Paisley had me drooling with all these beautiful elements of nature. I love the wheat, feathers and pods in the burkey tureen. Perfect. Rosemary and Thyme shows how elegant a table for two can be. 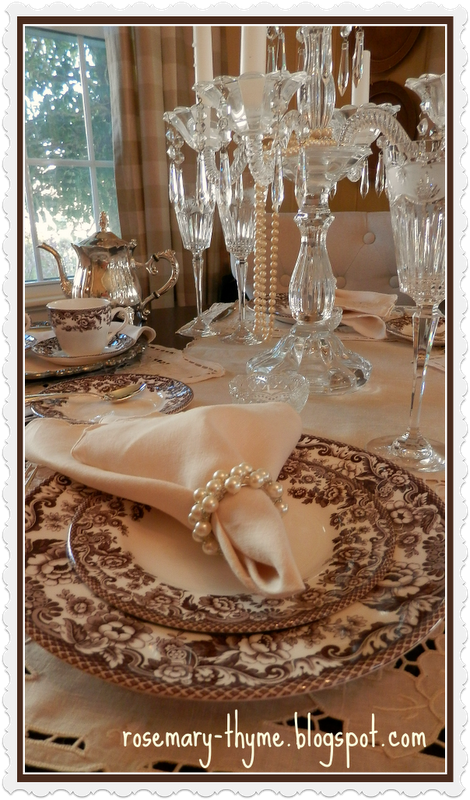 Love the brown transferware and the gorgeous crystal. Exquisite. Confessions of a Plate Addict did a fabulous table with orange and pewter. I love the blue and orange in her dining room, so pretty. All of these are gorgeous and so many great ideas if you are still working on your table. Don't forget our Elves for Ceekay fund drive. Just click on the Elves button for details, plus there is a donate button on my sidebar. I can't begin to thank you all enough for all of your prayers and kindness by supporting CK with your donations and purchasing Laura's Elves. You are all amazing and such a Blessing. Thank you and keep spreading the word. I know we can all do it together to reach our goal of fulfilling her Disneyland wish. Maty, those table settings are all fabulous. Gorgeous tablescapes for fall, Marty and sooo many!! Have a great weekend. Those are such beautiful tables, thanks for sharing Marty! Thanks for being such an inspiration to me too!! Hi Marty! Don't we have the most talented bloggers? These tables are so pretty. After I read your post about Ceekay and went and purchased an elf from Laura and added a post of my own. Have a blessed Thanksgiving sweet friend. Inspiration abounds from Table Top Tuesday!!! 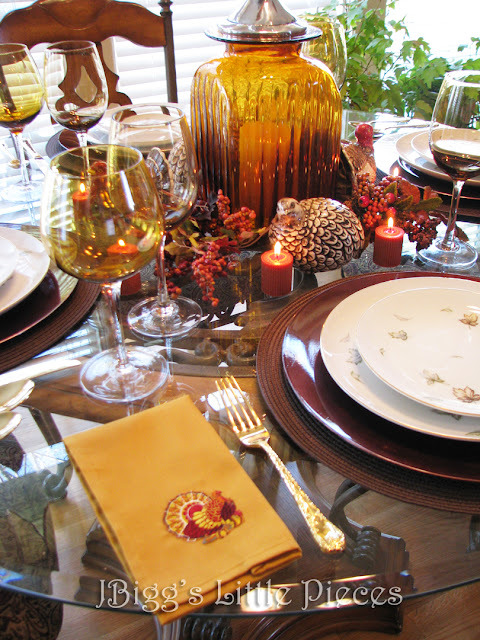 I've already bookmarked several of these creative tablescapes for use when we host Thanksgiving On Crooked Creek 2013!!! Thank you for sharing the talents of these creative Table Top Ladies in the Land of Blog for all of us to drawn inspriation for our own home decor! your beautiful pics you shared have finally gotten me into the spirit of decorating, thanks! Stunning tables! Just gorgeous each one. I think I need to pin away here! Oh WOW! They are all so beautiful ! Gorgeous inspiration. I love the brown transferware. Stunning. Thanks for the CeeKay reminder. Such love in these tabletop creations and in blogland in general. Happy Thanksgiving to you and to each beautiful blog you featured this week! 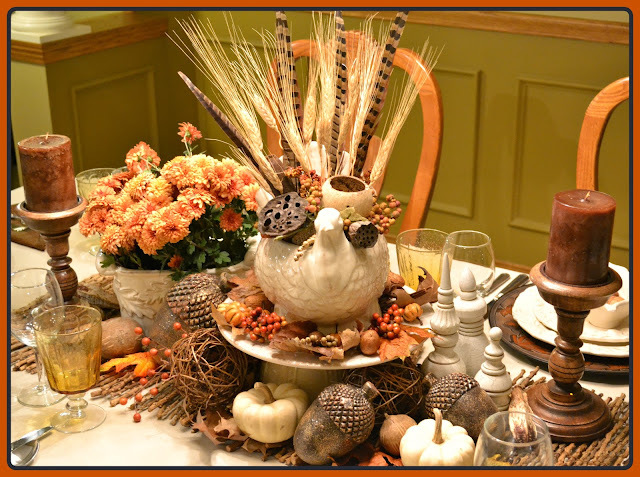 Thank you for featuring my tablascape this week.. All of the tables featured are amazing and beautiful and I am honored to be included with them all.. Have a wonderful and happy Thanksgiving.